"Make sure you put some apple sauce on your pork, it balances out the richness " Mum would say when I was a kid sitting round the dinner table over a pork roast. It's very simple - Pork & Apple works. 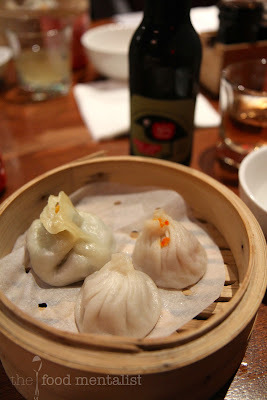 I recently had the pleasure of attending New Shanghai's Pork & Cider Dinner. 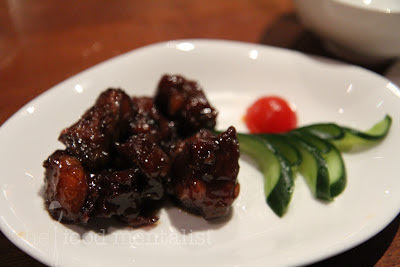 To begin we start with the Sweet & Sour Pork Rib cooked with dark vinegar sauce. The ribs are sticky and full of flavour but the dish is let down by the fact that it is served cold and the ribs are full of little bones making it very hard to enjoy. 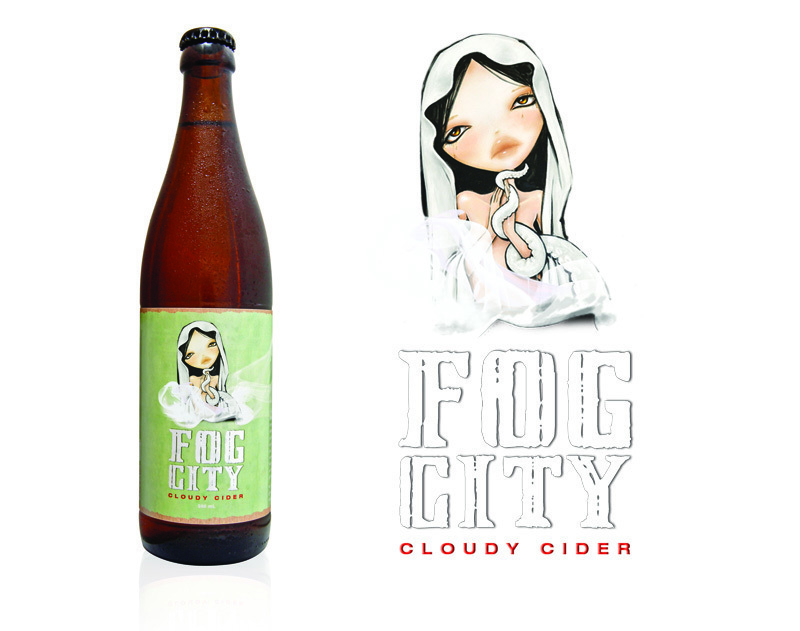 This dish is paired with Fog City's Cloudy Apple Cider which I absolutely love! See my review of this cider here . The only change in this cider, appears to be that it is now locally brewed in Victoria by East Ninth Brewing Co. 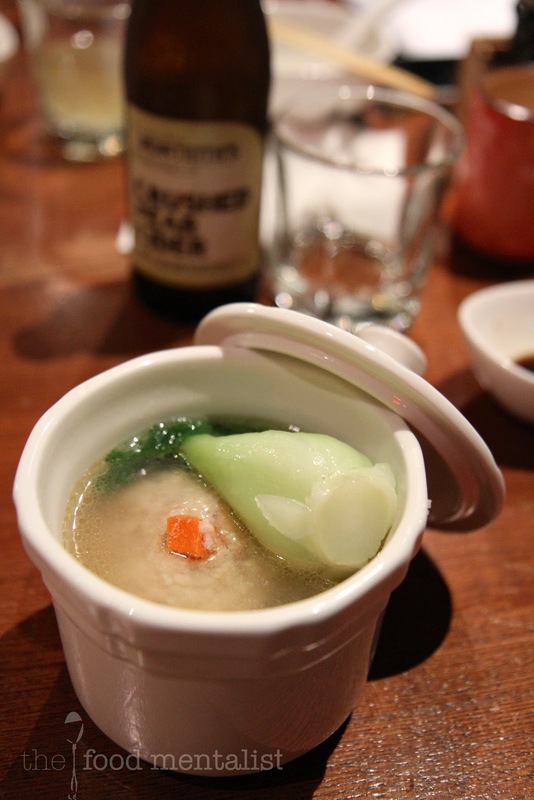 The second course comprises of a set of three steamed dumplings. The first one I try is the vegetarian dumpling with is brimming with shredded vegetable goodness. It have tried these before at NS's Ashfield restaurant and love these with brown vinegar which I also add on this occasion. The Xiao Long Bao, a soupy pork filled dumpling, is filled with hot seasoned broth and minced pork and it disappears quickly from my basket. I then move on to the Crab Meat Xiao Long Bao which is filled with a generous amount of sweet shredded crab meat - Yum! Accompanied by The Apple Thief's Pink Lady Cider, a gorgeous pink hued cider, it goes well with most things so it's no surprise this one has made an appearance.See my review of it here. 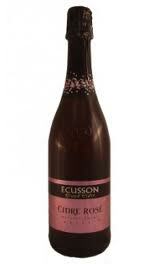 We are told that this cider is to accompany both dumpling courses so we are careful not to drink it too quickly. 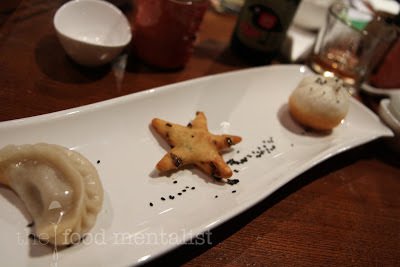 The Pan Fried dumpling course arrives next and I am delighted to see my favourite New Shanghai specialty - The pan fried pork bun ( Above - Far Right). Filled with hot soupy broth and delicious minced pork I can't get enough of these guys - the outer dough is what makes these beauties, it's SO good. By this stage those of us on my table are starting to get very full. This meatball tips us all over the edge. A substantial meatball filled with pork mince and generous amounts of shredded crab meat and vegetables. Served in a broth with bok choy it was a meal in itself and when paired with Montieth's Pear Cider, very filling indeed. I really like the change from apple to pear cider at this point in the meal though. 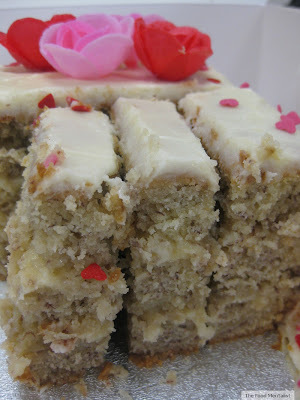 It provides a nice transition and gives a different flavour profile to the pork. Montieth's, a very drinkable cider, comes from New Zealand and is made using 100% juice rather than concentrates. To find out more about their ciders check out my review of their apple cider and pear and apple cider. The next dish is my favourite. Tender pork belly served in a steamed bun with fresh cucumber and hoisin sauce. More please?! Served with a cider I have never come across - Ecusson Rose Cider from France. Excited to be trying a new 'cider' variation, this one is quite sweet and has a fairly robust carbonation. Different, I will look into reviewing it here in the future so stay tuned. 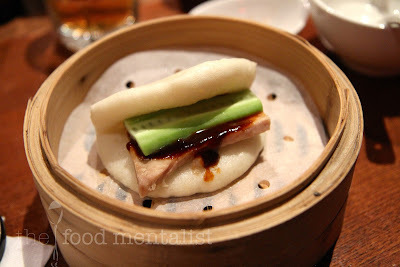 In terms of a pairing for the steamed bun - I felt like it was perhaps a little too sweet for this dish as it clashed slightly with the sweetness of the hoisin sauce. I would have preferred a dry cider for this dish. Did I mention that we were quite full a few dishes prior? 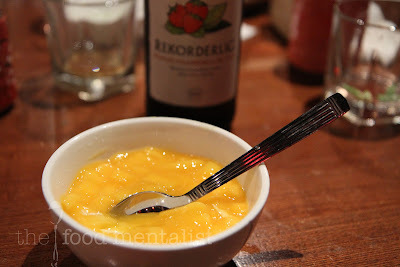 Cider can be quite filling, when had degustation style. Not that I was complaining! 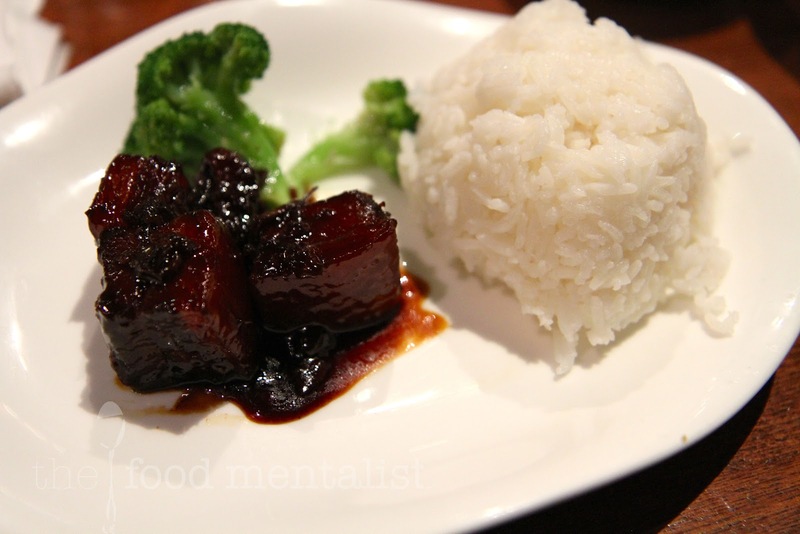 The pork belly in this dish had been braised overnight and was sticky, sweet and tender. 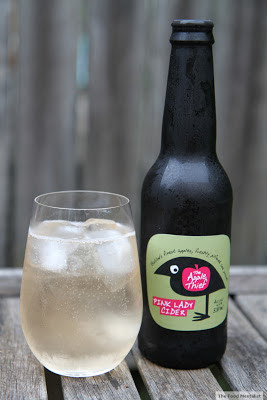 Again, I was delighted to see another one of my favourite cider producers make an appearance - Small Acres, Medium Sweet. We finished on a sweet high with a traditional mango pudding paired with Rekorderlig's Strawberry-Lime 'cider'. What do you think or pork and cider? Would you like to attend a pork and cider degustation? The Food Mentalist attended the Pork & Cider Dinner as a guest of New Shanghai. mmm i would like 10 pork buns please! Such a great idea to pair with cider. I went to their wine and food pairing, and I think cider would be a better match to the food in general.